US Secretary of State John Kerry has said the Syrian conflict is "in many ways out of control", as he made a fresh push to salvage a fragile truce. After talks with UN and Arab diplomats in Geneva, he said progress had been made on a plan to reduce violence in the second city of Aleppo. However, he said more work was needed and there was no guarantee of success. A cessation of hostilities has reduced fighting in Syria's five-year civil war but has unravelled in recent days. About 250 people have reportedly been killed in Aleppo in the past nine days. On Monday, fresh government air strikes and artillery attacks on rebel-held districts and suburbs of Aleppo left at least three dead, according to activists. Media captionJohn Kerry, US Secretary of State: "One party is blatantly violating that agreement"
Mr Kerry, speaking alongside UN special envoy Staffan de Mistura after a morning of talks in Geneva, said the conflict was "in many ways out of control and deeply disturbing". He said the nine-week-old cessation of hostilities had had "a profoundly positive effect" and saved many lives, but in recent weeks it had been "put to the test". Mr Kerry said the goal was to reinforce a broad truce that could withstand further tests. He also promised more ceasefire monitors to track violations "24 hours a day, seven days a week". "We're trying to press this as fast as possible but I don't want to make any promises that can't be kept," he said. The US secretary of state said a recent air strike on a hospital in Aleppo, which he blamed on the Syrian government, was "unconscionable" but he added that both sides, the opposition and the regime, had contributed to "this chaos". Before leaving Geneva, Mr Kerry spoke by telephone to his Russian counterpart, Sergei Lavrov. Both men reiterated calls for all sides to observe the cessation of hostilities, the Russian foreign ministry said. Mr de Mistura is due to travel to Russia on Tuesday. Mr Kerry's trip to Geneva was hastily arranged after Mr de Mistura appealed to the US and Russia, which back opposing sides in Syria's five-year conflict, to rescue the cessation of hostilities they brokered in February. At the start of a meeting with Saudi Foreign Minister Adel al-Jubeir on Monday, Mr Kerry said he would press rebel groups in Aleppo to separate themselves from the powerful jihadist group, al-Nusra Front. "This is what we're discussing, among other things. There are a number of different ways to approach it," Mr Kerry told reporters. Image caption Saudi Foreign Minister Adel al-Jubeir, left, said the violence in Aleppo was an "outrage"
"We're getting closer to a place of understanding. But we have some work to do." The Syrian government and Russia have said the Aleppo air strikes are targeting only al-Nusra, which is affiliated to al-Qaeda and is excluded from the cessation of hostilities along with the rival Islamic State group. However, the opposition and the US have dismissed the claim, and accused the government of targeting civilians and rebels abiding by the cessation of hostilities. "What is happening in Aleppo is an outrage. It's a violation of all humanitarian laws. It's a crime," Mr Jubeir said, adding that Syrian President Bashar al-Assad would be held accountable and would be removed from power either through a political process or by force. 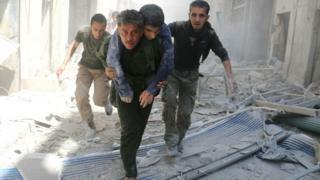 The fighting in Aleppo has also seen dozens of civilians killed in rebel artillery attacks on government-held areas. After at least 50 people were killed in a reported government air strike on a hospital last Wednesday night, the International Committee of the Red Cross warned that Aleppo was being "pushed further to the brink of humanitarian disaster". The talks in Geneva come a day after the Syrian military extended a "regime of calm" around the capital, Damascus, for another 24 hours. More than three dozen rebel factions said on Saturday that they would not respect the truce, unless the government agreed to extend it over the whole country.